The best Greek cuisine, most Greeks will agree, come from the island of Crete. 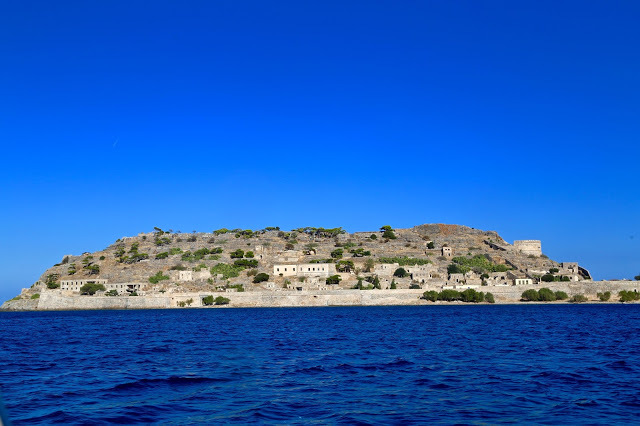 In ancient times Crete was the centre of the ancient Minoan culture, the earliest known advanced civilisation in Europe. (Astrological note: in world astrology, each great year lasts 2000 years. We are emerging from the age of Pisces going into the age of Aquarius. The Minoan period, obsessed with bulls, was the Taurean age.) It has always been a mercantile, trading island, thanks to its position midway between Europe and Africa. 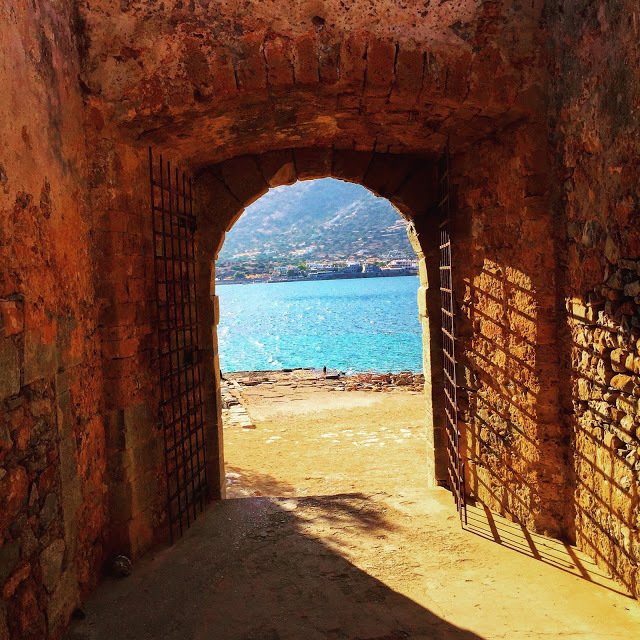 This geographical location also means that Crete benefits from a particular micro climate, which is fantastic for growing fruit, vegetables, producing high quality olive oil, cheese, yoghurt, honey and wine. Until the 1960s, there was an emphasis on a vegetarian diet, meat was eaten on special occasions. I only spent two days in Crete, mostly holed up in a posh hotel, so here is just a brief look. 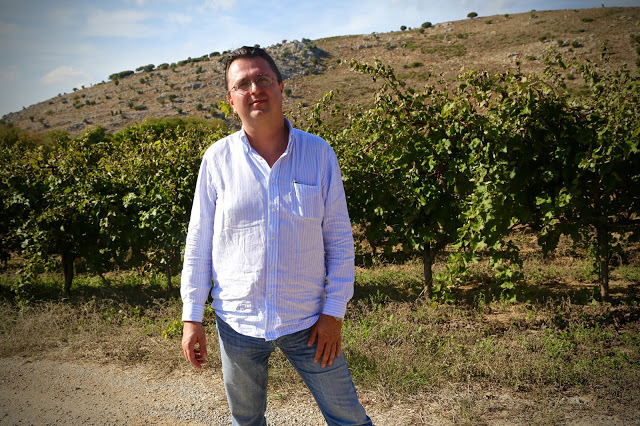 I spent an afternoon with Nikos Miliarakis, owner of Minos wines in the Peza area of the island, and tasted the range of his wines. It’s an ideal spot, with a cool maritime breeze and mountains that protect the vines from the hot southern winds. We strolled along the vineyard, brushing branches heavy with plump olives out of our path. The sky was marine blue, the sun was shining, a perfect summer’s day in October. Nikos told me that the olives would be ready for harvest in December. Capital controls happened in late June? 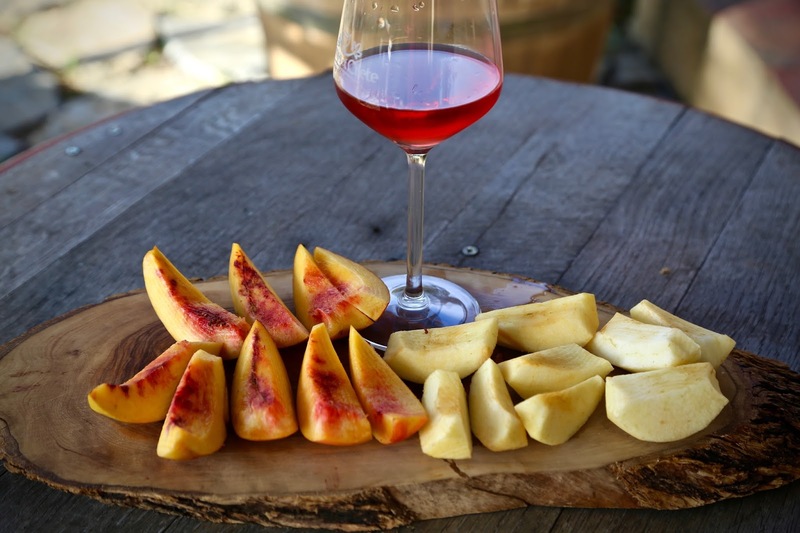 Is this a crucial time in terms of getting ingredients to produce wines? “Yes, in order to bottle you need corks and labels, you need money to buy them. Now everything is paid by cash? In terms of getting Greece back on its feet economically, food and drink is quite a large part of that? Was there a dip in numbers of tourists? We laughed at that. The one thing that Crete always has plenty of is food, being self-sufficient for the most part. Nikos: “it’s not the food we import, it’s mainly all the rest. Food, cheese, everything… we have it. Most Cretan hotels are all inclusive so you also have consumption of imported foods. I read later that day in the Greek national newspaper that British numbers of tourists to Greece have gone up 37% over the summer, a big spike. Nikos’ wine Turtle is available, along with other Greek wines, on Aegean airlines flights, for quite rightly they are serving excellent domestic wines as opposed to foreign wines. Paximathi is Cretan barley rusk. The Cretan rusk came about because the women worked all day in the fields like the men and didn’t have much time to bake. So they would make a huge batch of bread then dry it in a low oven. This way it would last a month. They would soften the bread by pouring a little water on it. 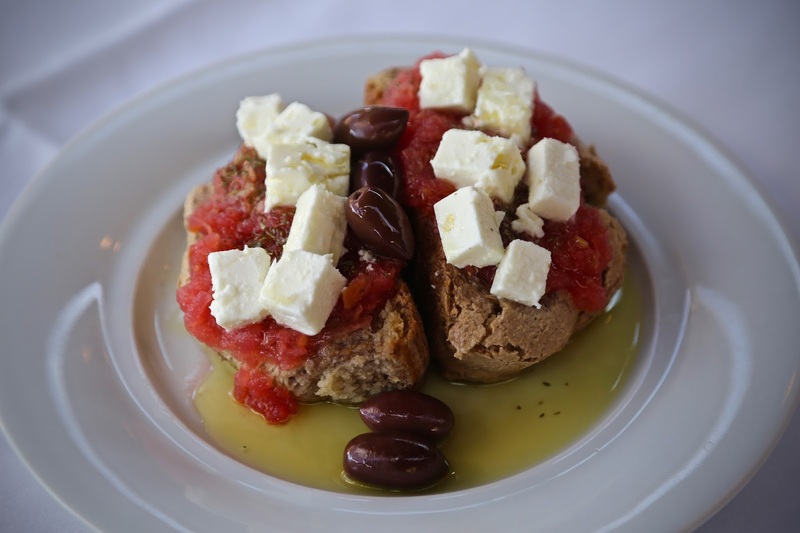 The ‘dakos’ salad is a crust or two of cretan rusk, then softened with water, olive oil, skinned crushed tomatoes, oregano, salt and pepper, a kind of bruschetta on hard tack. Cretan olive oil is some of the best and most ancient in the world. 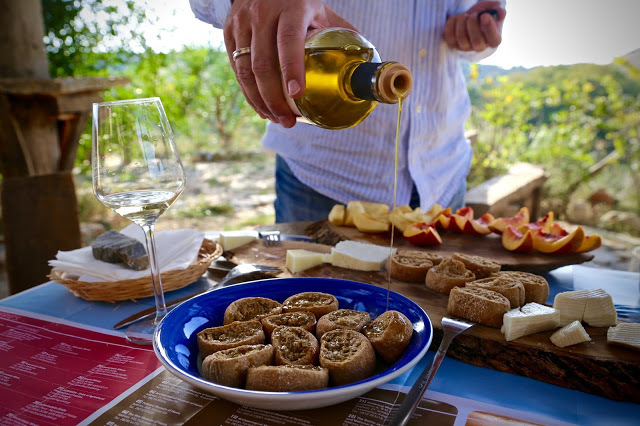 Much of Italian olive oil is actually bought in bulk from Crete then a small percentage of Italian olive oil is added. It is then bottled in Italy so it can be called Italian olive oil. This is not illegal. (Next month I’m visiting Sicily to find out more about olive oil). This is partly because it is only recently that Cretans wanted to get into the retail side of selling olive oil, it was easier to sell it in bulk. Nowadays they see what a great business it is. I did an olive oil tasting with a young Cretan, Giorgos Mavrakis returned from Athens to start up a business on the island. He gave me these tips on what makes a good olive oil and how to taste it. Smell it, it should smell like olive oil, not like paint or anything else. The glass should be warmed with your hand and be tasted in a dark blue glass so that the colour doesn’t influence your judgement. Taste it, roll it around in your mouth. It should taste bitter. Bitterness is a characteristic of quality olive oil. Never try more than three oils in a tasting, your palette can’t cope with more. Always buy olive oil in a tin or in a dark bottle. If the bottle is clear don’t buy it, sunlight damages good olive oil. Buy olive oil in a large tin, say 3 or 5 litres then decant it into a dark green bottle for use in cooking or at the table. Never buy olive oil in a plastic bottle. Extra virgin olive oil is a question of acidity. Extra Virgin has low acidity, not above .8% of acidity, it can go as low as .1% even. Virgin olive oil ranges from .8% up to 1.5% acidity. Many factors can affect acidity, the weather, the quality of the olives, the pressing at the mill, transport and storage. Italians and French like peppery, the Germans prefer smooth olive oil. The mass market prefers smooth, soft, non peppery olive oil. Our palettes need educating. There are several PDO’s (Protected Denomination of Origin) of Cretan olive oil. We were tasting olive oil from the Peza area, in Archanes, which is very good. Cretan olive oil dates back to the Minoan period, 2, 500 years BC and even earlier, 3,500 BC. The Egyptian pharaohs imported olive oil from Crete. The Greeks consume more olive oil than anybody else in the world. As one Cretan chef said to me “we don’t eat olive oil, we drink it”. 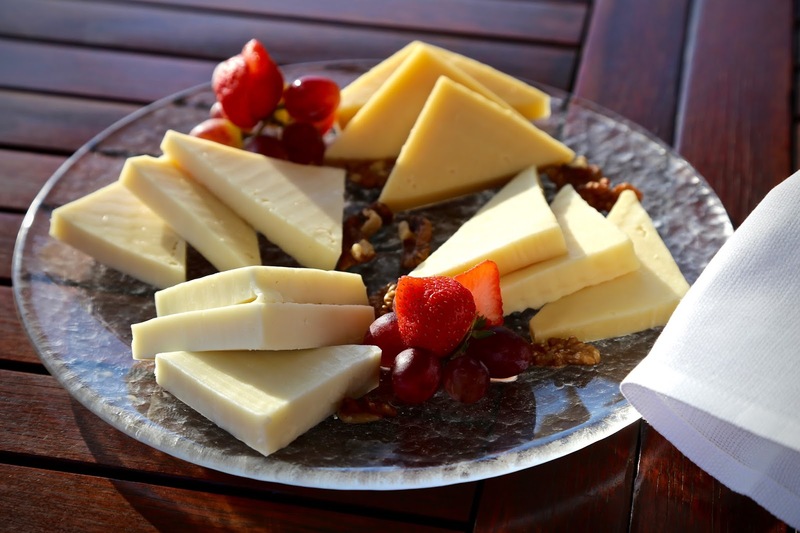 Cretan cheese has several varieties apart from the excellent chalky feta type which is referred to as white cheese: from Graviera (a kind of gruyere) to Myzithra, a young fresh cheese, or the interesting Xinohondro which isn’t a cheese but something like bulgur wheat mixed with yoghurt. A classic dish using xinohondro as a topping is tomato soup, to which it adds body and flavour. (I even saw this being served for breakfast). 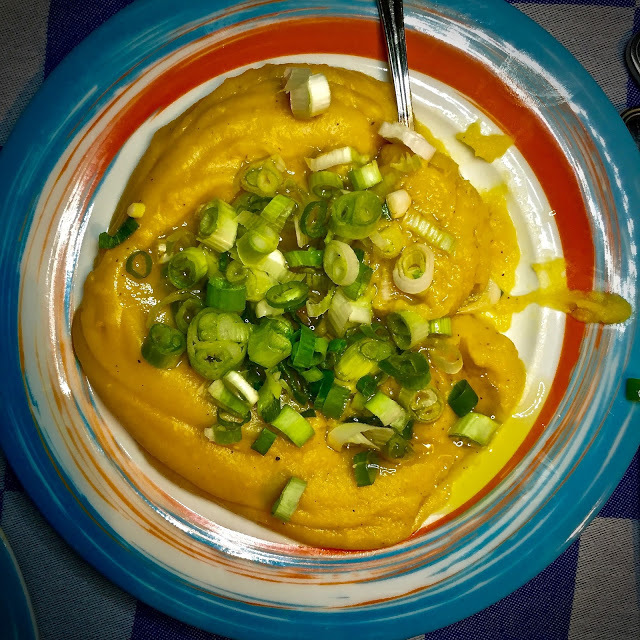 Gigantes beans, a kind of giant baked bean in tomato sauce is a popular meze in Greece but something typically Cretan is favas purée, split yellow pea hummus. It’s made in a similar way, adding olive oil, garlic, salt to cooked and cooled yellow pea puree. You add chopped red or spring onions. Looks rather plain but is a delicious alternative to hummus. A typically Cretan liqueur using raki and honey. This is a warming drink during colder months and a sweet digestif after dinner. Greek raki is different to Turkish raki, being more like fire water, so the addition of honey is welcome. Wild greens or ‘horta’ are heavily used in Cretan cuisine while purslane, also beloved in Georgian food, is an unusual ‘herb’, actually a succulent, that we tend not to use in the UK even though it grows here. Mix crunchy purslane with yoghurt for an unusual tzaziki dip, adding some lemon juice and salt. 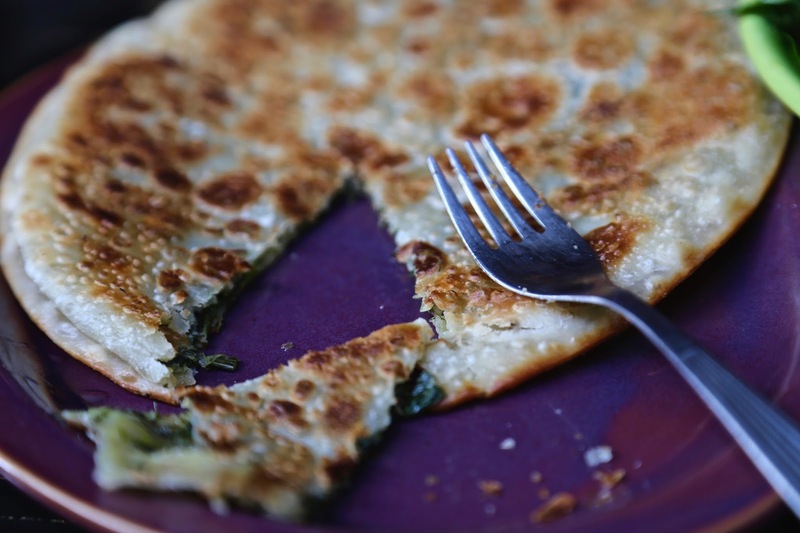 You must try these small flat cheese or horta ‘pies’ with honey, combining sweet and savoury, a very Medieval concept, a spicing that remains in Middle Eastern food. Crete is famous for its apiculture and honey is used on everything, including savoury dishes, for instance a cheese kaltsounia with honey. In Archanes village, at a wonderful delicatessen/cafe Bakaliko which also gives cooking classes, I had a honey tasting with Meligyris Cretan honey. We tried types of wild thyme honey and woodland honey with sage and with heather. 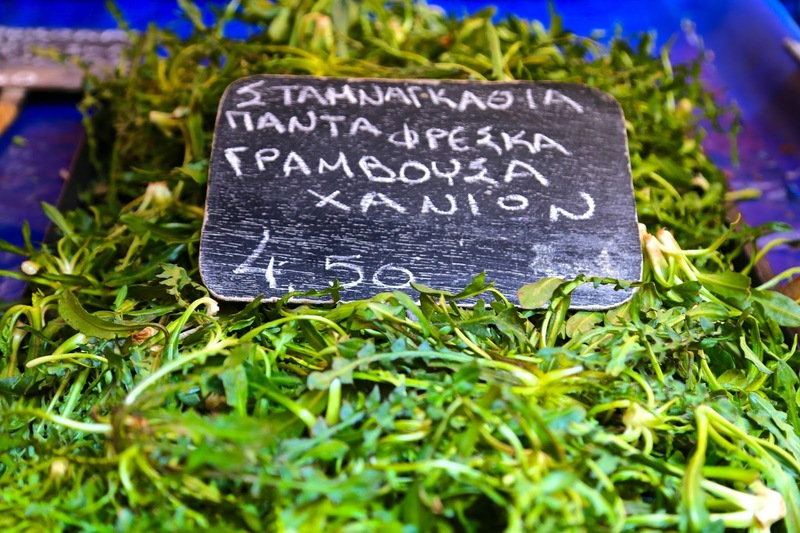 The flavours were strong and fragrant, the wild thyme has anti-bacterial qualities. 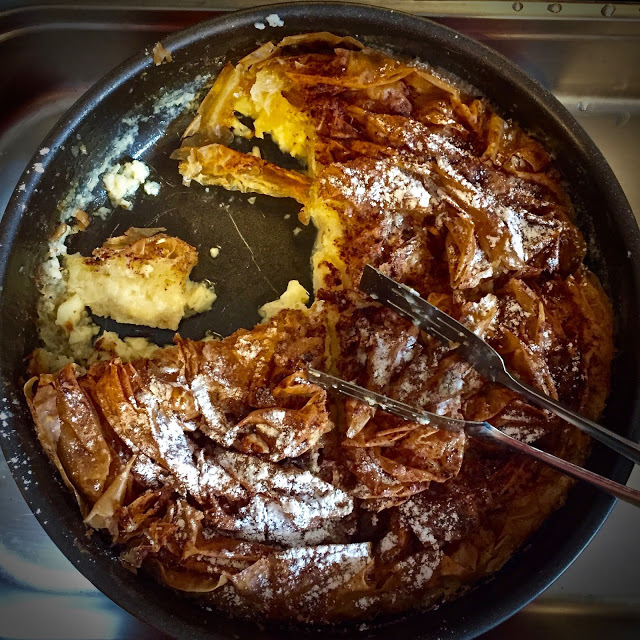 I had bougatsa often for breakfast while in Greece: it’s a kind of sublime custard-filled cinnamon filo pie. Here is a recipe, I must have a go at this myself. (One morning I also had a kind of gooey creme caramel for breakfast.) The breakfast bar at the Blue Palace hotel where I stayed had specialities from around the world: everything from Scandinavian, to Turkish, German, Greek, American, French, English breakfasts. My flight and trip was courtesy of #DiscoverGreece on Aegean airways. As usual the clever Cretans did a number on you! The only thing particularly Cretan in your list is the use of rusks (paximadia) as Dakos salad – not the rusks themselves, kaltsounia and their wine varieties. The rest you can find all over Greece. 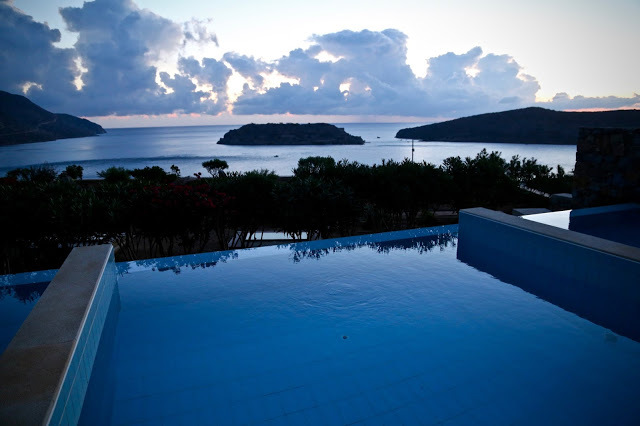 Also while Crete has a nice cuisine, so equally do other parts of Greece. 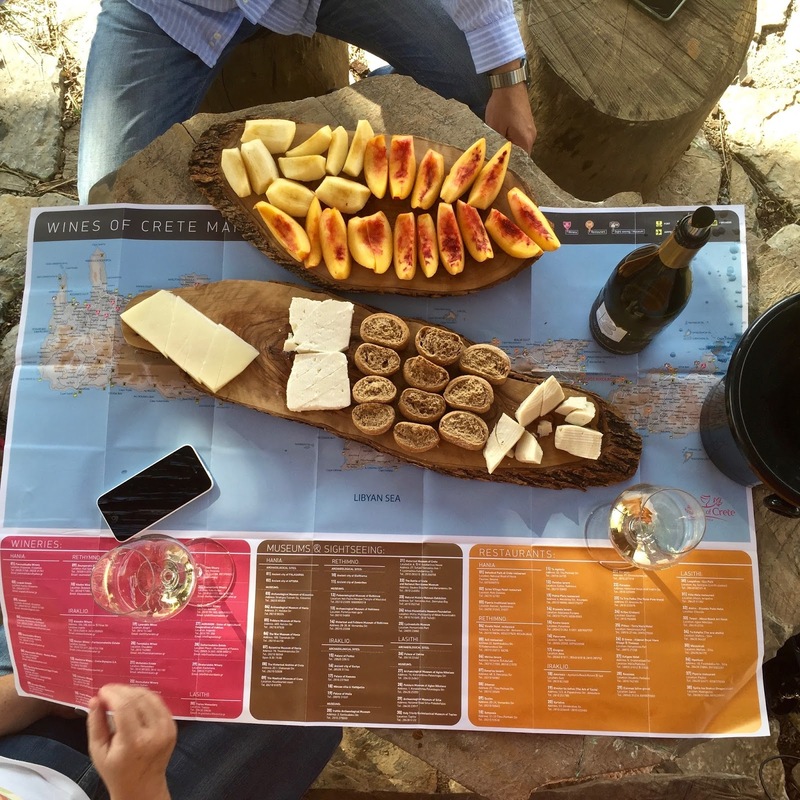 What sets Crete apart is that it is the biggest island with a lot of cultivatable land and thus has huge production, equalled only by Thessaly and Makedonia. Since it was one of the first places to modernize agriculture I actually avoid buying Cretan vegetables in the Athens markets. Every island has its island patriots, but Cretans are a race apart for self-promotion and operate within Greece as a mini-mafia! Interesting perspective! It was lots of Athenians who said to me that Cretan cuisine is the best. I would love to discover more about the rest of Greece too. True, what he said to you! I am greek and I can vouch that Cretan cuisine is maybe the best (but all greece has wonderful food)! Cretans are direct and honest people too! Thanks me decided where I'm going on holiday next year. Great post!